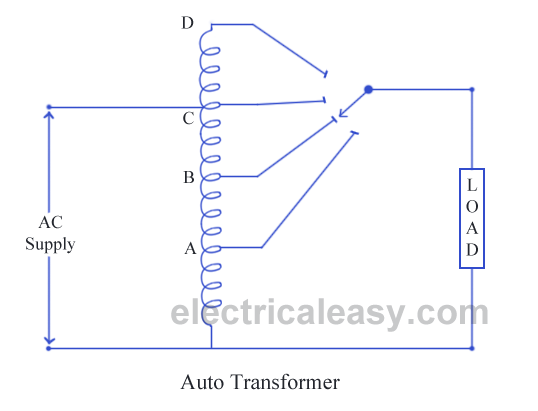 An auto transformer is an electrical transformer having only one winding. The winding has at least three terminals which is explained in the construction details below. 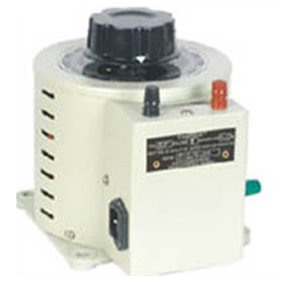 An example of application of auto transformer is, using an US electrical equipment rated for 115 V supply (they use 115 V as standard) with higher Indian voltages. Another example could be in starting method of three phase induction motors. An auto transformer consists of a single copper wire, which is common in both primary as well as secondary circuit. The copper wire is wound a laminated silicon steel core, with at least three tappings taken out. Secondary and primary circuit share the same neutral point of the winding. The construction is well explained in the diagram. Variable turns ratio at secondary can be obtained by the tappings of the winding (as shown in the figure), or by providing a smooth sliding brush over the winding. Primary terminals are fixed. Thus, in an auto transformer, you may say, primary and secondary windings are connected magnetically as well as electrically. As I have described just above, an auto transformer has only one winding which is shared by both primary and secondary circuit, where number of turns shared by secondary are variable. EMF induced in the winding is proportional to the number of turns. Therefore, the secondary voltage can be varied by just varying secondary number of turns. As winding is common in both circuits, most of the energy is transferred by means of electrical conduction and a small part is transferred through induction. harmonics generated in the connected equipment will be passed to the supply.